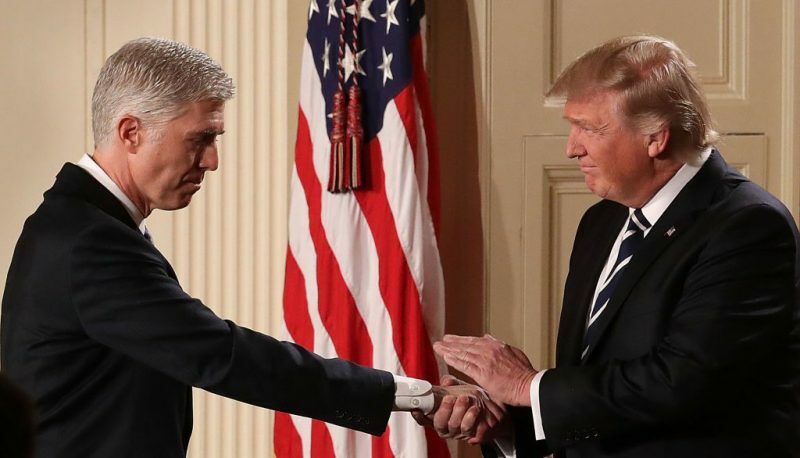 U.S. President Donald Trump shakes hands with Judge Neil Gorsuch after nominating him to the Supreme Court during a ceremony in the East Room of the White House January 31, 2017 in Washington, D.C.
As more and more Americans express concern about President Trump’s abuse of presidential authority and his derision of judges who do not rubber stamp his agenda, questions are also being raised about whether Supreme Court nominee Neil Gorsuch can be expected to stand up to the President and members of his administration. Gorsuch defenders are understandably racing to respond, but their arguments are without merit. In particular, they cite Gorsuch’s statements in private to several Senators that Trump’s recent attacks on the federal judiciary are “disheartening” and “demoralizing.” And they cite Gorsuch’s record questioning the Chevron doctrine of judicial deference to executive branch agencies, as evidence he will stand up to abuses of executive branch officials’ authority. Nothing could be further from the truth. In fact, his record demonstrates likelihood that he would not exercise the necessary independence. Let’s start with Gorsuch’s recent statements. Calling Trump’s attacks on the judiciary “disheartening” and “demoralizing” says nothing about his willingness to stand up to abuses of authority, and isn’t even very strong criticism of Trump’s wholesale attacks on the judicial branch, as others have commented. In fact, Gorsuch has refused to discuss with Senators substantive questions that might say something about his views on Trump’s actions, such as Gorsuch’s views on the Emoluments Clause of the Constitution, which Trump seems clearly to have violated. Indeed, Senator Blumenthal reported that Gorsuch wasn’t even willing to state publicly his tepid criticism of President Trump, and a recent tweet by a Gorsuch defender makes that clear. As to Gorsuch’s record, his defenders are conveniently confusing two different kinds of executive authority and Gorsuch’s views on each. It is correct to say that Gorsuch has a narrow view of executive branch agencies’ authority to interpret Congressional statutes and issue agency regulations implementing those laws, usually regulations that impose requirements on business to help protect health and safety. This is part of his attack on the Chevron doctrine, named after a unanimous Supreme Court decision, holding that courts should generally defer to reasonable agency interpretations and regulations – a doctrine that John Conyers has called crucial to the “ability of federal regulatory agencies to protect public health and safety.” Gorsuch has argued that judges should themselves interpret such laws and not defer to the views of the expert agencies. In another case, with an eerie resemblance to aspects of the current situation with respect to President Trump’s anti-Muslim executive order, Judge Gorsuch argued for deferring to the Governor of Utah who sought to unilaterally cut off funding for Planned Parenthood. A panel of three judges on the 10th Circuit (not including Gorsuch) granted an injunction against the Governor of Utah for defunding Planned Parenthood. The full 10th Circuit decided not to rehear the decision, but Judge Gorsuch strongly dissented and argued for deferring to the Governor. An important issue in the case was the Governor’s intent in cutting off funding. On that issue in particular, Gorsuch argued for deferring to the Governor, stating that such deference was appropriate in light of the “comity” that should be shown to states and their elected officials. A very similar issue has already come up in the current challenge to President Trump’s travel ban. What was his intent, and was it anti-Muslim? If Gorsuch were on the Supreme Court when it considers that question, which it very well could in the future, will he argue that the Court should defer to the President’s interpretation of his motives, out of “comity” or some other reason? At the very least, Gorsuch’s record concerning deferring to the exercise by executive branch officials of their own authority, even when it harms others, is extremely troubling. Contrary to his willingness to question administrative agency regulations, his unwillingness to question executive branch officials’ abuse of their authority suggests that he will not be a Supreme Court justice who will stand up to the abuse of presidential authority by Trump–at a time when that is exactly what the nation so desperately needs from the next justice to join the Court.